I may not be the sharpest knife in the drawer, but sometimes the depths to which my idiocy can stoop surprises even me. One day while surfing the internet, curious about how much it would cost to jump on a plane to Tahiti that same day, a pop-up jumped out of my screen begging me to do an IQ test. Now, although I implied only two paragraphs ago that I’m a few beers short of a six-pack, secretly I harbor thoughts that I might be a genius yet untested. Sensing my big moment was imminent and this experiment would prove it, I clicked on the pop-up, which was my first, but not biggest mistake in this tale. I took the test, which seemed reasonable and well-rounded and therefore legitimate. I even labored over it, so when they asked me to enter my mobile number so they could text me my results, I didn’t bat an eyelash. Bring on my genius results – my Facebook status needs updating. This, I will fully admit, was stupid, but still not the stupidest part. They did send me my results, as promised (I was smart, but not brilliant; I shuffled my Mensa application to the bottom of my to-do pile). This strange 66066 number proceeded to text me everyday at precisely 2:00 pm with a random question, like “Is Salomon Rushdie an (a) actor, (b) musician, (c) writer?” If only that damn IQ test was so simple. What I didn’t realize because I don’t scrutinize my cell phone bill every month, but rather just pay the amount in the box and grumble about the injustice of my contract, was that I was being charged $50 for this random question delivered to me 25 times a month. This was the stupidest part. The Mensa application is now filed under ‘g’ (in the garbage). It took about two minutes on eHow to determine that this five-digit number was a premium text number, and I only needed to reply to the text with the word STOP in order to be unsubscribed. I finally did so, and immediately got a message back saying I would no longer be participating in their trivia service. But I never did participate you blood-sucking, low-life spammer! 1. Do NOT click on any pop-ups, even if they tell you you’ve won a million dollars or invite you to tea with the Queen. 2. If you drop the ball on rule #1 because you’re dying to ask the Queen why she wears those silly hats, DO NOT provide your cell number for your royal invitation. 3. If you don’t adhere to rule #1 and #2, congratulations, you’re my idiotic kindred spirit, but don’t make my mistake and do nothing about it for months. 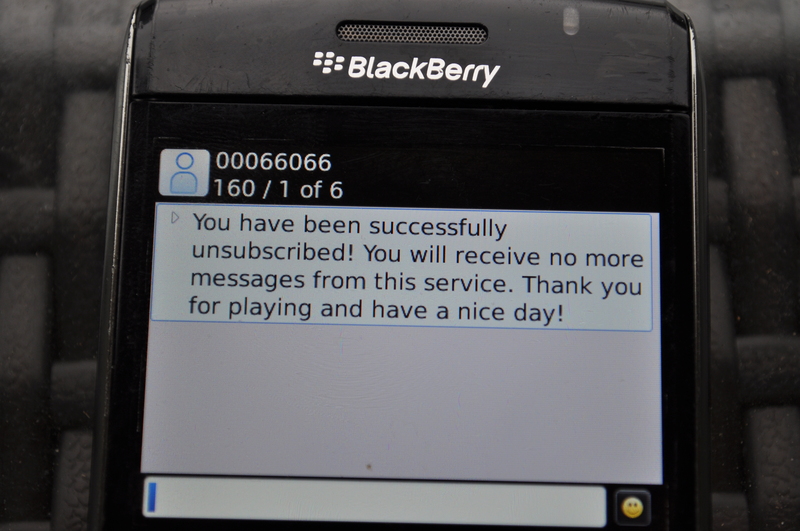 Read your phone bill, don’t rely on the texting gods to make it stop. Hunter boots are at stake. 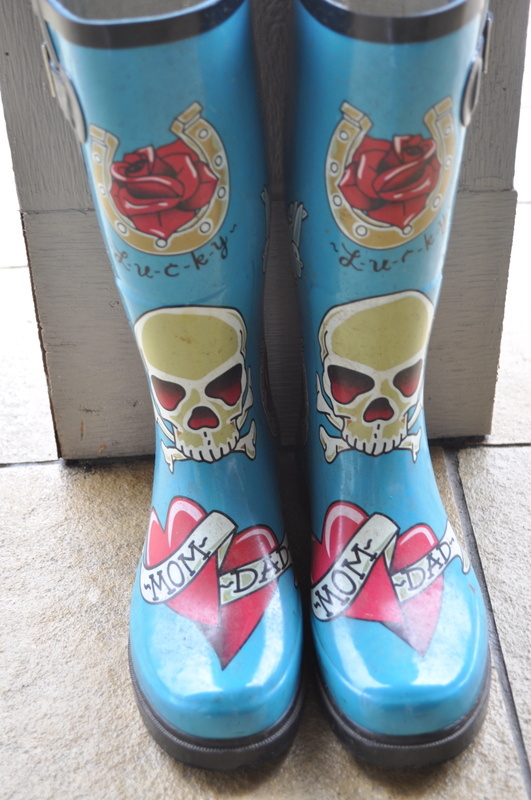 While the rest of my neighborhood dons their ubiquitous wellingtons, I wear my silly blue rain boots adorned with skulls and crossbones in my walk of shame, like an albatross around my neck, a testament to either my stupidity or poor fashion choices. Don’t feel bad, Deanne! I fell for the very same scam (although I realized within 10 minutes that I’d been had, and unsubscribed! )…what’s worse is that Jim is an IT guy, so we are super-sensitive here about viruses and their ilk! Think of all the money saved by marrying an IT guy, and go buy yourself some new boots! I like your boots! You’re hilarious! Just a fool with silly boots. Good luck tomorrow night – bring home the bacon! Haha and also? Is it wrong that I kind of love your boots? Thank God for eHow! Thanks Tori – I’m starting to feel differently about these boots, but still hate spammers. Thanks – it is redeeming to know I ‘m not the only one who makes such mistakes. And I’m feeling much better about my current boots! Those electronic thieves are very sneaky – pleased you sorted it all out in the end. Thanks – you’re right, better late than never, and valuable lesson learned.